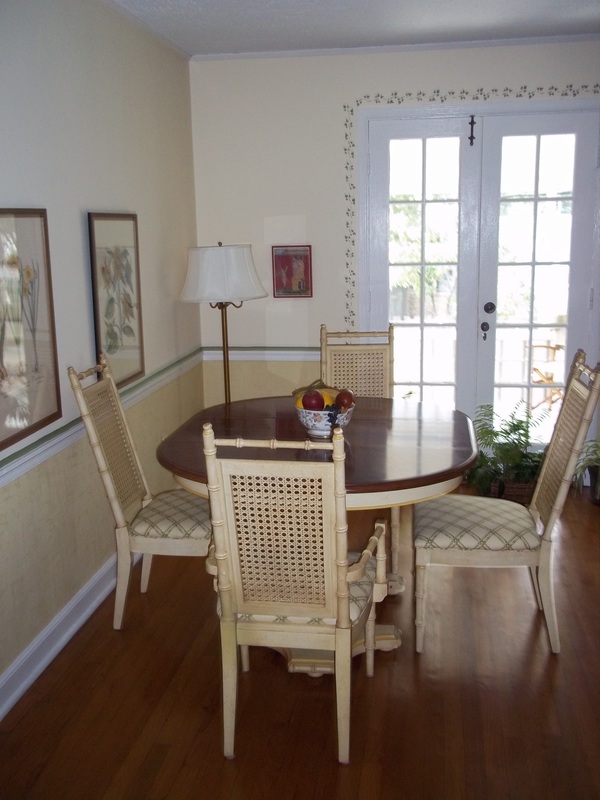 Thirty-eight years ago what was Droske’s Department Store delivered my first dining room set to The Creole at Yorktown Apartments near Houston’s Galleria. Two lemon yellow whicker chairs and two armchairs banked the cherry wood oval surface atop a complementary lemon yellow post with legs. Two leaves came with the set, enhanced by placemats in varied green tones. Rarely did I use tablecloths. Over the years guests spent hours sitting around my table enjoying brunches, luncheons, suppers, and potlucks. Neighbors chatted around it during open houses. My table also served for business contracts, for drawing, for studying for orals, for sorting books, for preparing my taxes, and in later years, to remind me of tasks to perform in a timely manner. However, frequent moves aged my dining room set: scratches on the chair legs, dried whicker in the chair backs, the uneven leaves. Even the lemon yellow lost its luster on the chair arms. And more accidents compounded the deterioration: water damaged one of the leaves and hot spills marred the surface of the table. It was time for change. Within hours, I accepted two bids: a refinisher’s to spruce up this set and a designer’s to reupholster the chair seats with a weave of green and cream and beige tones. Obviously, I will not enjoy another thirty-eight years with this table and chairs; they will enhance the dining room of another. All of this gives me pause. There is another Refinisher more than willing to restore our scarred spirits, if only we ask. His work endures, impermeable to the ravages of time.